My friend Dave Hockey is a coffee guy. He owns “Higher Grounds” in the Kensington neighbourhood of Calgary. Last spring, when we found out that our spouses were going to the same conference in Paris, I asked him if he wanted to broaden his scope from the bean scene and check out the food markets of Paris. “Our spouses can fill their brains, we’ll fill our bellies!” I told him. Nobody can call Mr. Hockey a bad sport so of course he signed up. He didn’t even balk when I told him it would cost him 120 Euros and he had to meet me at 5 AM. I had hired professional guide, Isabelle Bachelard to take us into “the belly of Paris” which is the nickname for Rungis (run-jees), the world’s largest food market. I take people on tours of markets in Calgary. Markets are my thing; so I really wanted to see the world’s largest. Isabelle explained the catch. “Yes, I am taking you there, yes, you can see everything, but only professional buyers can buy anything”. Isabelle and her boss Stephanie Curtis (an American who started the tours in 1975) are two of only a handful of guides allowed into Rungis. Originally, this market which serves all the restaurants and fresh food markets in Paris was located in the city’s heart at Les Halles. In 1964, Mitterand determined that it should be moved to the outskirts as the garbage and rats that came with it were getting to be too much of a health risk for Paris proper. 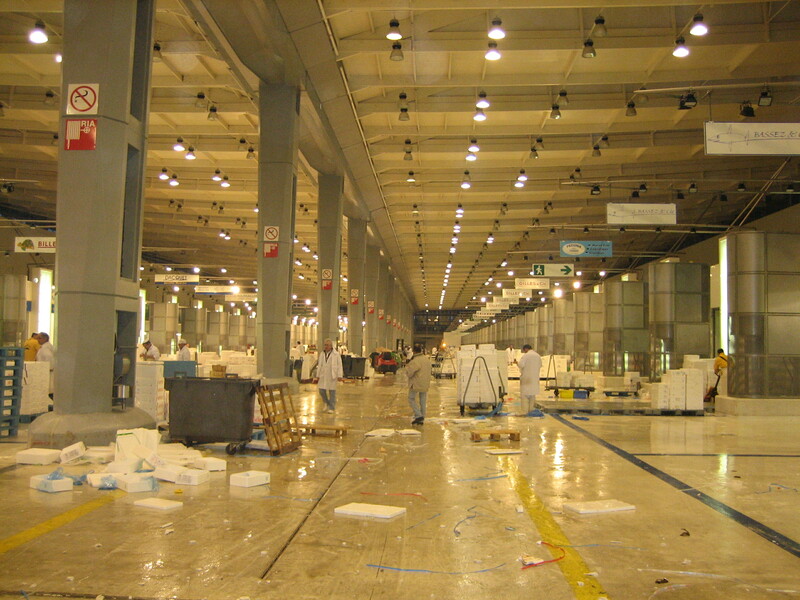 The French bureaucracy moved “swiftly” and a mere ten years later Rungis opened in its current location near the Orly Airport. Today the market covers over 1500 acres, employs 18,000 people and sees 20,000 buyers visit daily. The location next to an airport seems apropos as there are approximately 60 color-coded, government inspected airplane hangars divided into sections for fish, meat, small game, cheese, fresh produce, spices, and fresh flowers. The goal is that everything arrives between midnight and 4 AM and leaves between 5AM and noon in time for all those Parisian chefs to make something Michelin might want to hang a star on. We started in the Poisionniere or fish hall and at 5:30 AM some of the vendors were already sold out. We saw langoustines, turbot, mackerel, monkfish, cod, scallops, tuna, halibut, salmon and bags and bags of mussels, clams and oysters. Each box is labeled with it place of origin. The fish was shiny with nary a sunken eyeball. The whole place smelled exactly as a fish market should… like the sea and not like fish. The second stop was perhaps the roughest on my empty stomach. I called it the “Awful” hangar but it was really the offal hangar. Hanging heads, tongues, livers, intestines are not a pretty site at any time but we saw it and mercifully we were quickly on to the other meat hangars. My favourite was the one for fowl and small game. After “awful”, fowl was looking good. 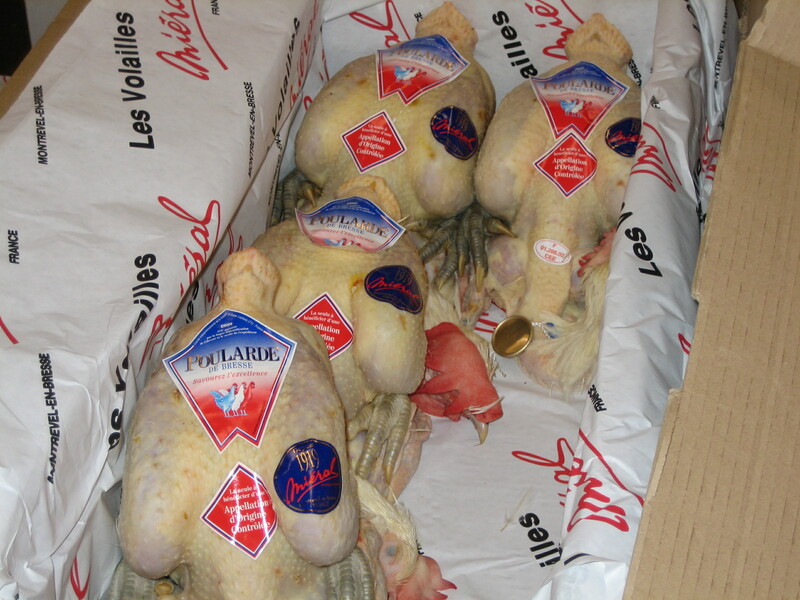 I was amazed to see that the French have even made an Appellation D’origine Controlee for some of their chickens. I had read “Poulet de Bresse” on several menus around town and indeed here they were. Chefs pay 3 times regular price for these red-combed, white feathered and blue legged chickens whose meat is firm but succulent having been finished with milk and corn after months of free-range living. We also saw row upon row of fresh foie gras. All the hangars were refrigerated and cool but like an oasis each had a fully sealed and very lively café where workers could whip in for a pull of espresso. Dave started to salivate. Isabelle, seeing this, decided it was time for our own coffee break and she whisked us off for a bol of latte and fresh pain au chocolat. Fortified with chocolate and caffeine it was onto the cheese halls where we actually got to taste a few varieties as we wondered down aisles towering with Comte, swiss gruyeres, bries, camenberts, neufchatal, and goat’s cheeses in every shape and size imaginable. The next eight hangars held produce. It was white asparagus season and the bundles were in abundance. There were bushels of those perfectly skinny French green beans and artichokes still heavy with moisture. Native strawberries and raspberries fought for space with Spanish oranges, tiny new potatoes, fresh garlic, green onions and bouquets of lettuces. The French are manic about mushrooms with morels, chanterelles, button, crimini, shitake, oyster and the king of mushrooms, Cepes, being displayed next to herbs of every sort. We finished our tour with the flower market and then went out to join the gridlock that is the Paris commuter’s daily ritual. 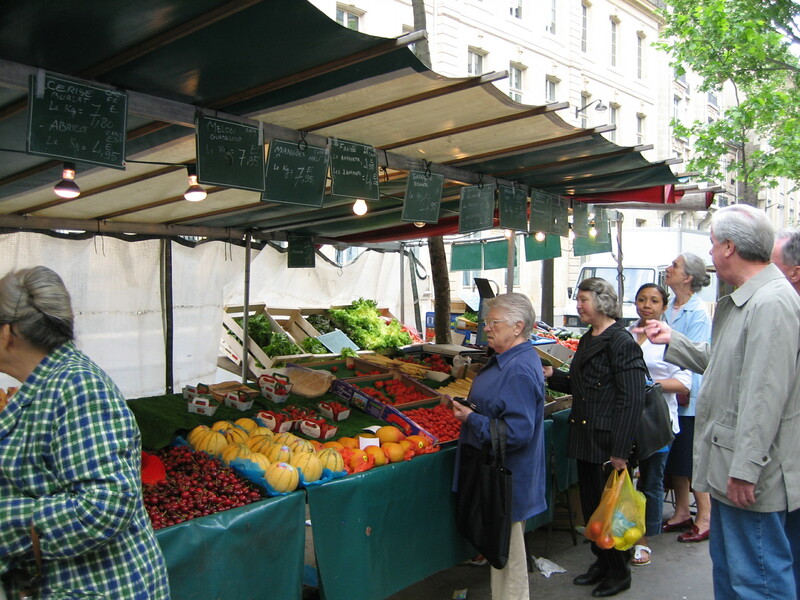 It was a Tuesday so I got Isabelle to drop us at the Rue Raspail Street Market. We moved along the canopied stalls and wondered from which of the vendors at Rungis these goods had come. We strolled along the streets of the posh 6th arrondissement and perused several fine coffee and tea shops to admire the displays. We found our way to Poilane Bakery at 8 rue du Cherche-Midi, where a loaf of their famous rye can weigh up to 4 lbs. We bought little buns to sustain us and made our way to “Le Grand Epicerie de Paris” at Bon Marche, 38, rue de Sevres in search of a good bottle to go with that bread. 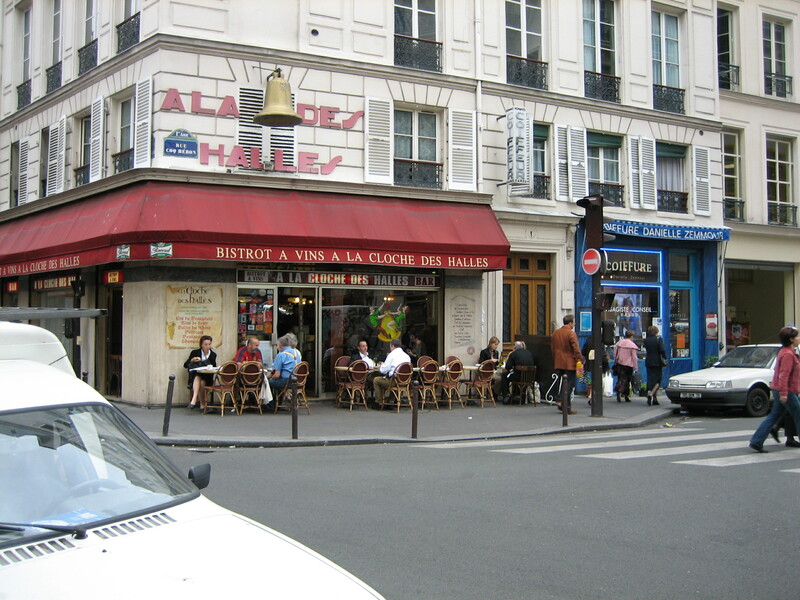 I persuaded Dave that to really fully understand the significance of moving Rungis to its current locale we must travel full circle and have lunch at a café Isabelle had recommended near the old Les Halles back in the first arrondissement. 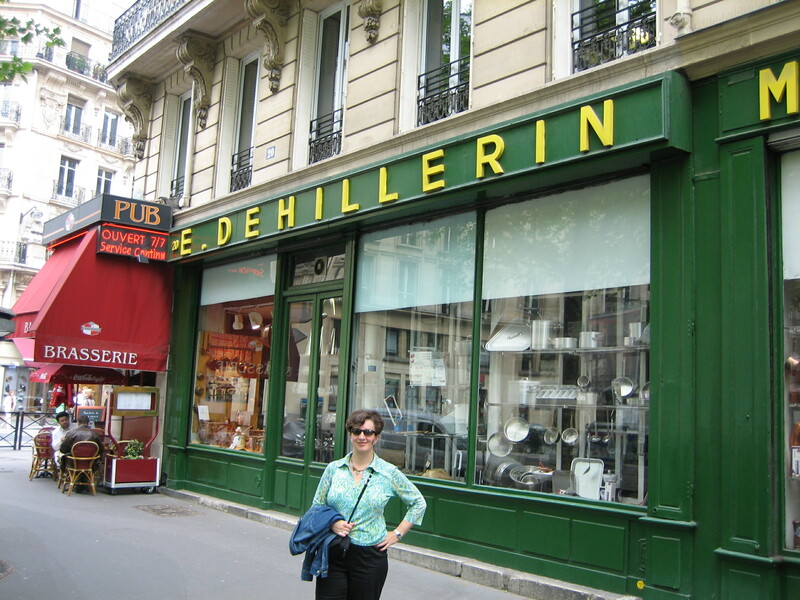 An hour later we were still walking and when I told Dave I just need to “pop in” to the famous cookware store E. Dehillerin (18 & 20 rue Coquilliere) for some ”indispensable” silicone Madeleine pans he positively gave me “the look” my own husband would have given me! Finally, we flopped down in the side walk café chairs of “La Cloche des Halles”. The food was good hearty pub fare, the Alsatian white was crisp and as it flowed from the glass into our bodies it zapped the last of whatever high I had been on. It was 3pm by the time I got Dave back to his hotel. I am sure that by the time I boarded the metro; Dave had collapsed in a near coma. No rest for me, a quick shower, a rendezvous with my husband and off to the Left Bank for dinner at “Le Christine”. My husband, knowing me too well, inquired as to the health and safety of Dave. Well, I am sure he feels like he went into the belly of Paris… and came out the other end I replied. Poor Dave, groaned my dearest. As for me, I have come home in wonder of the food I saw and after seeing the control and disbursement of fresh food in France I am also beginning to wonder about our food at home. Where does it come from? Who grew it? What is the quality we are eating? Paris has once again given me food for thought. Le Christine Restaurant – 1, rue Christine – tel (01 40 51 71 64) Boris Bazan & Emilie Benoist are the charming couple who own and operate this chic but welcoming place with divine food. Le Dome –108, boulevard du Montparnasse – tel (01 43 35 25 81) fabulously fresh seafood and impeccable old world service. Laperouse – 51m Quai des Grands Augustins, restaurantlaperouse@wanadoo.fr tel (01 43 26 68 04) Expensive but divine with a view of the Seine. Chez Pauline – 5, rue Villedo – tel (01 42 96 20 70) Chef-owner Andre Genin is a gracious man and a wonderful cook. Bistro Burgundian food at fair prices. Le Carre – 12, Place Saint Augustin – restaurantlecarre@wanadoo.fr tel (01 44 69 00 22) – a little out of the way spot in the 8th with a mix of French and world cuisine. Since I wrote this piece, I read Émile Zola’s The Belly of Paris and can recommend it for anyone who would like to understand the significance of Les Halles to Paris and of food to the French. It’s a classic work of naturalism and exemplary for its ability to depict everyday life of Parisians in the era leading up to the French Revolution. It was fun re-reading your account of visiting Rungis with my colleague, Isabelle Bachelard! Yes, we are still leading food-lovers and Professional chefs on early morning visits to Rungis, which has not changed much since 2007. One important post script, both or our emails have changed. If you find an appropriate place to mention the new contact information for both Isabelle and myself, this could be useful to your readers. Stéphanie Curtis, stephanie@piro-curtis.info, tel: 33 (0) 1 45 27 05 05 or 33 (0)6 06 77 57 76; Isabelle Bachelard, i.bachelard@orange.fr, 33(0) 6 82 10 49 14. Merci mille fois Stephanie et bonjour a votre belle amie Isabelle! I’m so glad you are still conducting those wonderful tours to Rungis and I hope many people read this blog, your comment and follow-up to arrange visits. What you offer is truly unique and awe-inspiring. I may be back in Paris next spring with a group so I’ll be in touch if my plans come to fruition. Thank you Karen for your quick and warm reply. Yes, please be in touch when you come to Paris. In addition to the Rungis visit, I also offer a Cheese, Bread and Wine tour including visits to Poilane’s oven, a MOF cheese monger, a typical market, and it all winds up with a convivial cheese, bread and wine lunch at my home. I’ll be in touch Stepanie.